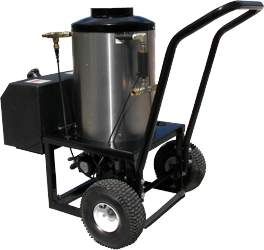 CMC Pressure Washers & Equipment LLC., Hot Box Page. Hot Water Washers, Hot Water Pressure Washers, Power Washers & Steam Cleaners. Powder coated frame, stainless coil wrap and schedule 80 coil. Adjustable thermostat heats up to 190 degrees, high limit over temp protection. Safety pop off over pressure protection, 8-gal diesel tank on diesel models. Inline flow switch, 35ft. cord with GFCI on 115V model, 10" pneumatic tires on portable models, LP HOT Boxes include regulator and gas hoses. please click here to e-mail your request.